Notice the pattern that the honeycomb takes; this is a hexagonal tessellation. These patterns are seen in many biochemical phenomena, including carbon allotropes such as graphene, and big carbohydrates such as cellulose. We’ll be done in the next few days with the molecular basis of inheritance. This means that the chapters on animals are getting closer. With this in mind, and knowing that the due date for your comments is very near, I wanted to share a post that accounts for the A in the STEAM model of science education. “Colony collapse is significant economically because many agricultural crops worldwide are pollinated by European honey bees. According to the Agriculture and Consumer Protection Department of the Food and Agriculture Organization of the United Nations, the worth of global crops with honeybee’s pollination was estimated to be close to $200 billion in 2005. Shortages of bees in the US have increased the cost to farmers renting them for pollination services by up to 20%.”–Via Wikipedia. This entry was tagged animals, Art, Chapter 32: Introduction to Animals, Chapter 33: An Introduction to Invertebrates. Bookmark the permalink. It is amazing to see how art can be found in nature and it can be created with the work of bees. They are hard-working animals that are essential for the world’s agricultural processes and without them, our world is threatened. Here is an article of the TIME magazine that was published in August 9, 2013. Bryan Walsh talks about the possible disaster of farmers and food with the consequence of mass deaths in bee colonies. Supermarkets all over the world will be a very sad sight. I was very amazed to learn about how the population of the bees is decreasing in North America and Europe. I didn’t really pay much attention to the importance of bees in agriculture, I saw them as an annoying animal. We talked about how important it was for the bees to pollinate plants, in class, in order for plants to reproduce and for genes to pass from generation to generation. In the link below it talks about the solutions people are inventing in order for people this downgrade in yhe population of honey bees. This is a very good blog. It’s author is Samantha, a High School student. Also, the webpage is sponsored by Nature, possibly one of the most important scientific publications out there. Great find, Valeria. I knew that bees were becoming extinct but I was amazed when I found out that they were degrading in a very high degree. I also found out that bees play key roles on our lives, especially on our nutrition. They are also vital for plants. Bees are responsible for pollination and if this process ends the plants could die and stop or diminish the reproduction of plants where bees should be present and are most needed. Bees also play a key role in nutrition because the honey they produce is used to complement many of our daily foods. Also, honey has a lot of antioxidants that can help us on our health state. I used to look at bees as annoying bugs of destruction but now I see them as one vital bug for life on Earth. Bees are known as “vectors”, the link between the gametes of a plant, and the reproductive apparatus of another plant. If this “vector/gamete” relationship is somehow disrupted–and, unfortunately, colony collapse shows all indications for this disruption–, humanity will be seriously threatened. Fortunately, artists like Aganatha exist. She can spread awareness about the potential crisis through her art. I’ve been reading about the bees becoming extinct for quite some time. A few weeks ago Cupey was filled with bees and everyone was going crazy, I remembered being in the car, and thinking that it was impossible for them to become extinct any time soon. I went home and read the following article in the Huffington Post were the author invited a beekeeper to a convention about bees in 2015 and the person rejected him because he said that by that time there were not going to be any bees around. When I read that, I was shocked. In our daily routine we do things without really thinking the causes it might have in the future. Killing bees has been always viewed as something normal to do, but today’s generation is seeing the outcome of past generations. Bees play a huge part in the worlds agriculture. I think a foundation should be created to protect bees and find a way for them to keep reproducing in order to reach a high level of existence. It is unbelievable how important this small animal which most humans hate is so important for life to function properly. This animals are taken for granted, we forget their important role as the one who move the pollen form plant to plant. This moving of pollen called pollination is essential for plants to grow since they produce oxygen. Viruses like the tobacco ringspot virus and many other found in pollen are thought to cause this massive deaths. Pesticides are also blamed for this deaths since they cause many irregularities in bees. While many consider this statement controversial because they say Einstein did not say this.They say he was not a entomologist and did not know enough about bees, but the important part is to be aware of the problems it will bring and take action. The problem with colony collapse resembles climate change: we do not see an immediate impact in our lives, so there’s nothing wrong; we can carry on with our irresponsible ways of consuming. The fact is that scientists have been crying ‘Wolf!’ for decades. Maybe we should start listening to them if we care about future generations of humans. I remember that the fist time i really grew conscious about the importance of bees was when I saw “Bee Movie” with my little brother. It may be a simple kids movie but it has a strong message. Through the characters we see that bees are hard-working animals and without them life wouldn’t be the same. This is why we humans need to work on keeping the bees alive before they become extinct. I think humans sometimes forget that we live in a planet with many different life forms and therefore the space needs to be shared. To continue the long existence of our species, we must learn how to co-exist. The concept ‘interdependence’ is very relevant when discussing this topic. It is fascinating and beautiful how people keep finding new ways to interconnect science with art. I find it extremely inspirational how the STEM to STEAM project works. This movement of achieving the objectives of integrating Art and Design in the education model of Science, Technology, Engineering and Math is amazing. It will result in children around the world growing up and developing in an extremely rich educational environment. This will create future generations to be well rounded intellectuals. This project not only further improves structured education and innovates students along with professionals, it is thought to also be a strategy in order to improve the economy. The 21st century will see unprecedented challenges that’ll have a great impact on how people think. This means that we need an updated approach to how we teach certain subjects, especially science. The fact is, although I’ve talked about ‘updating’ the way science is taught, to use art, and to approach its teaching in interdisciplinary ways, is actually to look back at what is known as the “Renaissance Man”; a concept that, unfortunately, has become unfashionable, thanks to our pathological emphasis on specialization. Someone once told me that bees are very important in life but I didn’t really knew why. I made some research about the importance of bees and found that they pollinate 80% of our flowering crops which constitute 1/3 of everything we eat. 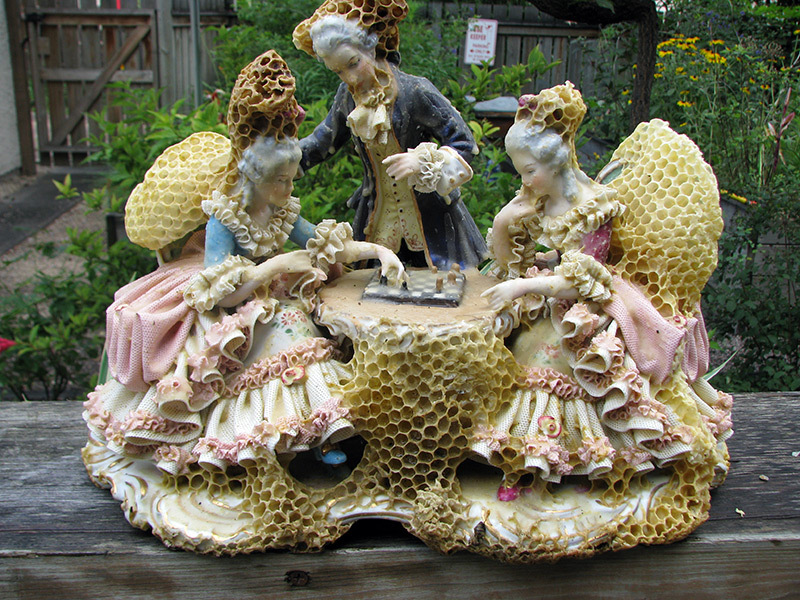 Its incredible how bees could create sculptures wrapped in honeycomb like shown in the picture of this blog. Bees pollinate 80 percent of our flowering crops. Losing them could affect not only dietary staples such as apples, broccoli, strawberries, etc. but may threaten our beef and dairy industries. Many plants are entirely dependent on particular kinds of bees for their reproduction. I was amazed to find out that they were degrading in a high incidence. This little insects are important to nature, agriculture and humans. I first learned about the honey bee problem in this class, and when I first heard about it I not only felt bad about the declining honey bee population, I also couldn’t help but worry about what this meant for our future in regards to all the things bees provide for us. I found this article that helped comfort me, about an alternative pollinator; the mason bee. According to the article, not only are less mason bees needed than honey bees to pollinate certain fruits (one mason bee can pollinate 12 pounds of cherries, something that requires sixty honeybees), but they are also more gentle than honey bees and rarely sting, making them easier to handle. Good to know. I did not know about the mason bee. a conservation biologist who has traveled the globe studying bees, describes bees as powerful creatures that help sustain the life of humans. “To begin to tantalize the wonderment of this critter … the next time any one of us takes a hearty teaspoon of honey, would you believe that that’s 6,000 miles, 10,000 kilometers, that a dozen bees have spent their entire foraging lives – three weeks, seven days a week working – to make that one teaspoon,” says Dr. Reese. In this interview, Dr. Reese offers unique insights into where bees originally came from, how they function, and how certain human interventions are disrupting their normal activity and even killing them off. I knew that bees were decreasing in exagerated ways but i didn’t really understand why they were so important until now. They pollinate the majority pf our flowering crops and that is very important. Bees are very important for us and we kill them all the time because we think of them as annoying animals. Now I am very conscious of there job in nature and i will do whatever I can to help. This video surprised me with a lot of things. It surprised that the bee population is degrading. Also i liked Aganetha’s work with the collaboration with bees and her honeycombs. I looked up more photos about her honeycomb sculptures in the link below. After watching that video I felt suprised because I didn’t knew the amazing way that Science y related to art. It is very interesting how humans can make important agricultural thing to help the bee’s live and cross pollinate themselves. Humans pay an important role on the process of the bees because they are the one’s who take care of them and maintain this process of pollination. After reading this I found a link about some important artists that also have collaborated to this. Wow, what an amazing thing! I have never heard of anything like it. It sure is an amazing way to combine art and science. It is wonderful to think that as these bees create beautiful works of art they are at the same time preserving their species for generations to come. They are also making sure that all forms of life on Earth exist for a long time to come. These bees are truly artists! Bees are probably known best for producing sweet honey and painful stings, but this little insect does a lot more than that. Bees are basically our under-appreciated workers since many are killed by us humans due to ignorance. Most people don’t consider how crucial a bee’s role in life is. Why are bees important? Well bees are important not only because they’re the world’s most important pollinator of food crops but because without them the development of life on Earth would’ve never been the same and the conditions for human development may not have existed. Multitudes of bees are dying and at a quick rate. My question is… Will bees reach extinction? The conservation of the honey bee can benefit a lot from ethical use of biotechnology. but little recognized role in most terrestrial ecosystems where there is green vegetation. In tropical forests, savannah woodlands, mangrove, and in temperate deciduous forests, many species of plants and animals would not survive if bees were missing. it is very interesting how nature and art come together and with this help the bees pollinate which is their biggest, most important role. I found this short but good video which explains how important bees are in nature and how we can help keep them alive for the pollination needed which they provide almost an 85% of it as said in the video. I was amazed by Aganetha, the artist. She’s a pretty old lady, but still very much engaged in art and science. I love how art works hand in hand with our understanding of science and nature. I found this video very interesting. I was unaware of the hard labor of bees in our world. It is a shame that they are decreasing in population in such a way yet it is amazing how humans can help them survive. Fact is bees play a crucial role in the polination of the world. It is truly shocking to know how such small animals have such a great impact in human life. We should make people concious of the ways in which these animals impact our lives and how to protect them. It is spectacular to know that people such as Aganetha dyck create art to transmit the ideas of, in this case, bee preservation. I did some research on other artists who through their art, portray some endangered species. The 21st Century will see a rebirth of interdisciplinary approaches, especially in science and art. I believe that when people see such a small organism like the bee, they tend to underestimate its importance and power to help. I knew bees where the most responsible for pollination to be possible, but I never imagined what would happen if bees where to stop this great and very much needed process. Their decaying and degenerating numbers is something that must really worry us, and we must take part and grow knowledge for this, for they are indirectly responsible for our life. This just makes me ponder and ask myself, what will happen if bees stop to exist? What resources would humans turn to if bees aren’t present? It is incredible that insects such bees that we seem to think there are millions of them surrounding them, are declining its population. According to this BBC report, England is the country suffering most from this loss when they have just a quarter of the bees required for pollination. The causes are diverse (diseases and pesticides) but the consecuences can be disastrous not only for the economies of many countries but for our own lives. It is important to create conscience and stop this phenomenon while there is still a chance. Indeed. Europe has to approach this potential crisis with every possible resource. Bees are in charge of many foods due to pollination. If bees go extinct, artificial pollination will be needed to produce food. Artificial Pollination is when humans “spray” pollen to the plants to do a bees job. All this started due to the bees decrease and lowering of production. This was really interesting to see, I would’ve never expected bees to be down in population. I’ve always known bees have had some kind of significance in pollination but I didn’t know they had so much significance, and to see that farmers are buying bees to help pollinate really shows their true importance and necessity in the agricultural world. And it’s so shocking to see how such small creatures can make such a big difference. Bees are hard-working creatures that keep life going. They are the pollinators of the world, but unfortunately they are becoming extinct. We have a strong interdependence with these tiny, yet huge animals. They contribute immensely to the world’s economy. Also, without bees it could be a struggle to sustain a population of 7 billion people worldwide, since food would be scarce. It is sad how some people don’t value the effect bees have on our lives. I find interesting how artists are using bees as their guest workers for their projects. This technique shows us another way to combine art and science. As Aganetha, other artists are using the same method. The links will show you some of their work. It is highly possible that the collapse syndrome of bees is anthropogenic, i.e. man made. So, this means that we can stop it. How? Proper agricultural practices—less pesticides; less frankenfoods; more nature. Frogs can be indicator species as well. Mass extinction of frog populations may indicate antropogenic causes damaging a particular ecosystem. Great article, Felipe. Thanks for sharing. 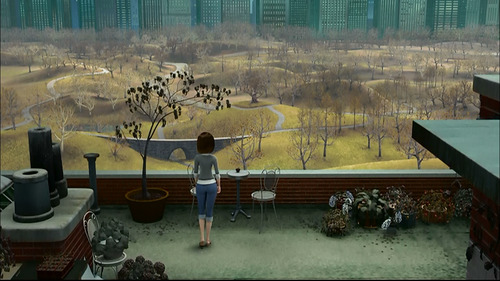 This is how the world would look without bees pollinating. Bees are an essencial part of our environment, without them, we would not have the beautiful flowers or the plants that gives us oxygen. Although they are small, they have the power to sustain the entire ecosystem. Art like this not only look impresive, it also raises awareness to protect the bees. Bees are normally thought of as bothersome creatures, who don’t really do anything but bring harm and sting people. In reality, bees are extremely important not only to humans, but to the environment as well. They are known to be the crown jewels of the pollinators; and have a great impact on the economy. I find it rather interesting how Aganetha Dyck used bees to create her innovative art work. Not only did she create something completely new and beautiful, she also raised awareness for bees. I mean, who would have thought that bees were capable of doing so many things; including artwork! This blog is also a great example of how art, science, and nature can combine to produce something extraordinary. I find it amazing how art and nature came together to create beautiful pieces and artwork like the ones Aganetha made. Not only does it show how both art and nature can combine to make great things, but it creates some consciousness about the importance of bees and the amazing things they’re capable of. The fact that bees are endangered is actually a big deal and it worries me. Bees are basically in charge of pollination and if they do disappear we will be left with various problems. If bees do go extinct it’ll affect agriculture immensely, creating food shortages and the overall loss of vegetation everywhere. Apart from pollinating plants and creating art from their honeycomb, as that video shows, bees have other amazing talents that other animals do not have. For example, honeybees are excellent mathematicians. Scientists claim the tiny insects can calculate angles, and can even comprehend the roundness of the earth. It is incredibly amazing how honeybees chose the shape of the hexagon for their hive, mostly because they needed a shape that stored the largest possible amount of honey using the least amount of wax. Bees should definitely not go extinct, because these amazing mathematicians also pollinate our plants, which is a very important process. Bees are extraordinary and powerful animals. I find Aganetha Dyck’s work really interesting because she collides art, science, and conservation. I was surprised to discover that bees are an endangered species. Many people dislike this animal and find it useless, not noticing that they are very important for human life. Bees are proof that just one individual can make a difference (and cool art). It is very disappointing that many people see them as a stinging nuisance when, in fact, they are one of the most important species on Earth. They are responsible for pollinating the flowers of plants many organisms need to survive, including ourselves. Sadly, they are quickly going extinct. I remember seeing bees everywhere (and being terrified of them) when I was a small child; now I see a bee every couple of months or so. Aganetha’s works are beautiful, thought provoking, and a perfect blend of art and science. I like how the honeycomb helps stabilize the sculpture while making it more interesting, just like the bees’ purpose on this planet.